What is the Best Gaming Chair in 2018? Finding a good gaming chair can often feel like the pursuit for the holy grail. Believe me, I know, as someone who has raided in World of Warcraft, gotten to diamond in Starcraft 2, and wasted many hours attempting to raise my ELO in League of Legends. I’m also someone who works from home, working on my writing craft, so I know how important a good office and gaming chair is for not only work, but also for play. If you sit in a uncomfortable chair for 8+ hours, you are going to develop some back, hip, neck, rear, and perhaps even shoulder pains. In this guide, it’s my mission to help you find the perfect gaming chair. Depending on your budget, stylistic preference, and use case, you can find the perfect gaming chair here. What chair do I use? Well, none other than the Steelcase Leap. In my mind, it’s probably the best gaming chair in 2018 (but also hard on the wallet). Looking to buy a good mattress to ease your back after gaming? Check out our best foam mattress guide to find the perfect mattress for your price/budget. There are many different types of gaming chairs with different purposes. Are you looking for a chair for work AND play? Are you looking for a chair to use while you play PS4, Xbox One, or an older console? Perhaps you want a chair that fits into an office that works for gaming but doesn’t look like a gaming chair? Or maybe you have dreams of creating a custom racing chair setup for games like Need for Speed or Forza. This is one of the most trendy types of chairs out right now. You’ll find this type of chair popular with streamers, YouTubers, and professional gamers at competitive gaming events. The chairs are very similar to what you might find in a racing car, hence the racing name affiliation with many of the chairs. Popular brand DXRacer sort of pioneered this type of chair and a lot of other chair companies have followed suit with cheaper iterations. Racing styled bucket seat chairs like the kind that DXRacer builds are great for gaming or media consumption since you can recline in them and truly get “comfortable”. The chairs are very sturdy and the style is quite cool in your office. The chairs often have fun colors, and the leather material feels very smooth and premium to the touch. Amazing styles offered to complement “gamer” persona. Often come with various pillows to experiment with. Amazing recline abilities, some can go so far as 180 degrees. Some users find racing styled chairs too firm, but a majority of people find they adjust to the padding and find it supportive. These chairs have limited adjustments. You have to buy the right size. These chairs can recline, but it’s not synchro-tilt or based on the pressure you lean back with. Leather materials can be sweaty. DXRacer started the bucket seat styled racing gaming chair. With DXRacer, you have tons of options from small chairs to HUGE chairs that cost around $600. Starting out around $299, DXRacer really prides quality as each chair is built with steel frames, high quality foam, and leather materials. DXRacer makes some of the strongest and most durable chairs on the market, but they also look cool and feel very comfortable. Check out this sizing guide to make sure you get the right chair! The Ficmax Ergonomic High-back office/gaming chair is one of the most popular chairs on Amazon right now. The reason being is that its super sleek, comfortable with a leg rest, and the price is very good. It has a bit more of a premium feel and experience than some other similar chairs in the price range. We really liked this chair in our review, to give it 4/5 stars. The chair even features an electric massager which is very interesting. If you want something a little different than a DXRacer, consider the E-Blue Cobra gaming chair. Similar to DXRacer chairs, this chair has racing flair with side ridges on the seat and a design to hug your body alongside your spine. The chair has polyurethane leather, a highly resilient foam sponge filling, and a durable steel foundation. The armrests have 360 degree rotation as well. If you like the look of DXRacer chairs, but can’t afford to plop down $299 or up, then consider the $199 moderately priced Kinsal gaming chair. Styled just like a DXRacer with side ridges and wings on the seat, you’ll be hard pressed to find significant differences. That said, DXRacers probably have heavier duty materials. But, just like DXRacer, the chair comes with two pillows and the coloring is even identical to DXRacer chairs. If you’re on a strict budget but still want a “gaming styled” chair, consider this low-budget executive swivel chair. It won’t have racing style pillows, or the same racing flair, but the chair is comfortable with a decent design that has mandatory features like height adjustment and swivel capacity. Ergonomic office chairs are often one of the best choices for gaming due to their extreme adjustments, flexibility, and amazing comfort. You will find a lot of tech reviewers or more “well-off” gamer’s with ergonomic office chairs. These chairs represent the pinnacle of comfort, and many a gamer who is sick and tired of back pain or other ergonomic pains will often resort to buying used or brand new ergonomic office chairs like the Steelcase Leap or Herman Miller Aeron. Tons of adjustments, more so than any other type of chair. VERY expensive. Upwards of $700+ for a good ergonomic office chair. Doesn’t look too much like a “gamer” chair in some ways. For some, the Embody is the king of ergonomic chairs. And in terms of price, it certainly is the most expensive. Clocking in around $1200, the Embody represents the pinnacle of design and manufacturing when concerning office chairs. The chair’s back is laid right open, so you can see the live pixel system with interlocking parts that support your spine when you move in the chair. Coupled with multiple adjustments, and good quality materials throughout, the Embody is a modern ergonomic chair that feels state of the art. My personal favorite chair is the Steelcase Leap. One reason could be that my last Steelcase Leap was made in 2001 and lasted well over 16 years to the present. The fabric has resisted the age of time, and the high-density foam inside still is comfortable. The best part about the chair is the complex number of adjustments and ergonomic back design. The Leap, among the other Steelcase office chairs, probably have the best and most adjustable armrests on the market. Whereas the Leap and the Embody use polyester type fabric as their main material, the Ergohuman departs with breathable mesh and constructed aluminum framing. The chair is quite cool since it comes with a headrest without additional cost, and the two back pieces are adjustable independently from one another. This means you can get the perfect fit with the chair. The Vertagear Triigger chair might have a weird name, but it’s the only “gaming” branded chair that I would actually consider ergonomic. The reason is that most “gaming” chairs don’t have core ergonomic features like proper lumbar support, adjustable arms, or mesh construction to make the chair breathable. Sure, leather looks cool, and so does the ability to lean back 180 degrees, but if you work as much as you play, the Triigger is a hidden gem. The Steelcase Amia is one of the best deals on the market if you want a high quality ergonomic office chair. Sure, it might technically be as good as the Steelcase Leap, as I discussed in this article, but it still has so many features to take advantage of that can benefit your long-term gaming experiences. Take for example, the amazing adjustable arms, the adjustable seat depth, and the smartly designed backrest. If you’re an Xbox guy or PS4 lover, then consider getting a rocker chair. Since these chairs are lower to the ground, and often have rocking capabilities, you might find they are a better experience than sitting upright in a gaming chair. You can easy lounge in these chairs, and all X Rocker gaming chairs have great speakers that you can wirelessly connect to your console to get amazing surround sound. Some chairs even have vibrations to make your experience even more immersive. Very comfortable for gaming consoles. Great speakers that are easy to connect. Easy to move around, perfect for students, high schoolers, or man caves. You can fold them! Can look out of place in a traditional living room. Due to low stature, not suitable for desk gaming. Can be somewhat small for taller gamers. If you want the best and most robust X Rocker available, then the 51396 model is the way to go. This powerful chair comes with multiple speakers with built-in subwoofers. The pedestal gives you great viewing angles, and the wireless receiver works with RCA stereo outputs. The design is great for larger users as well since the chair is quite beefy. While the 51396 is the most expensive and perhaps best X Rocker chair, the 5125401 comes in a slightly different style with some similar features. It doesn’t have the same exact shininess to the material, but the 5125401 still uses a leather-type material that feels ultra sleek. With neat cutouts in the headboard, and included speakers within the chair, the X-Rocker 5125401 is still a high performer with a slightly different look. Lower in price than the last two options, the 51259 makes up for what it lacks in material quality with pure features. While the chair lacks a pedestal, the 51259 boosts more speakers than any other X Rocker chair since its one of X Rocker’s newest options. The chair sports 4 speakers, vibration feedback, padded arms, and a comfortable design to make console gaming pure bliss. If you want the most affordable X Rocker chair but want to keep the features, check out the sleek 5143601. In many ways, choosing a X Rocker is mainly about choosing the style you want since most X Rockers are similar. The 5143601 has armrests, included speakers, the ability to fold, and a pedestal. If you’re on a lower budget, or just want a barebones recliner-type console gaming chair, then consider the Proxelle Gaming Chair. Sure, it doesn’t have a pedestal or the ability to rock, but the chair does have a sweet futuristic design, included speakers, console compatibility, and like most of the other rockers, you can fold it! If you love playing racing games, and love using racing wheels / gear shifters, then you need a proper seat and proper mounting stand for pedals, your racing wheel, and shifter. A custom-styled racing seat is perfect for immersing yourself into driving games. There aren’t a ton of options out there, and many people tend to jerry-rig their own custom driving setups, but if you want to just purchase a custom racing chair kit, then you’ve come to the right place. Great mounting experience for wheel, pedals and shifter. Much easier than building your own chair and setup. The Openwheeler Advanced Racing Seat Simulator is one of the best racing seats you can buy if you want to step up your racing simulator experience. The chair comes built with ergonomics in mind with back support, but the real kicker is the number of adjustments you can configure to get your racing simulation set up right. The chair can be moved forwards or backwards , the wheel mount can be moved forwards or backwards, the chair can be reclined, the seat can be adjusted, and the racing mount can even be adjusted in angle. Simply put, getting the Openwheeler is one of the best ways to jump start a custom racing setup. If you’re a more casual type gamer, or someone with kids, or you just love bean bags, this section is for you. Bean bags are great to just plop down in and they are actually kind of trending right now. The reason is that people are starting to see the value in the ultra-portable and super-cool furniture that is bean bags. These bean bags aren’t like the ones you sat in your elementary school. No, these are big boy bean bags with tons of memory foam and lasting materials. Easy to share with others. Great for students or constant relocation. Perfect for movies or TV. Easy to fall asleep in. Not as structured as a chair. Perhaps not as ideal for long-term gaming. If you want the best and most comfortable bean bag for gaming, check out Chill Bag 6′. This is a six foot bean bag that is stuffed with memory foam materials. It’s so big you can sleep on it, play games on it in any position you want. It’s the most comfortable bean bag you can find, and it’s not even that expensive. The amount of comfort stuffed into this thing is worth it since it’s built with premium materials like super soft micro suede. This is similar to the last bean bag, but slightly smaller. It has the same great micro suede material and memory foam padding. It’s just slightly smaller, and slightly cheaper. Sofa Sack isn’t quite as premium as the “Chill Bag” brand. The cover is different, as it’s more of a sleek material. The material is just labeled as “ultra soft material” but I would imagine it’s sort of like a stretchy polyester. The bag still does have memory foam filling inside and it feels quite good after a long day of work in front of the TV to spend gaming or watching Netflix. Similar to the last sofa sack mentioned, just smaller, the 5 feet charcoal Sofa Sack is constructed with a soft polyester type material with memory foam stuffing inside. It’s great for gaming, media consumption, or if you want a play for your cute dog to sleep. Best Gaming Desk to Suit Gaming Chair? So now that you have a gaming chair, what about a gaming desk? Well, I’ll present you with two drastically different options. If you’re on a budget, get the Atlantic gaming desk. This desk is perfect for those who want to save a few bucks but also want some cool features like tons of storage compartments. With this desk, you can hang your headphones, your drink, or even just keep your iPhone on display. The desk is lightweight, sturdy, and a great deal. If you want the best gaming desk, consider the DXRacer Gaming Desk. This desk is a BEAST. It has multiple spots for cable management, a weight capacity of 110 Lbs, side bumpers to keep your stuff on the table, triangle shaped support for extra sturdiness, and a slight ergonomic slant to keep your wrists happy. Want inspiration for your gaming setup? Check out some of these cool battle stations that I found featuring gaming chairs, gaming desks, and other gaming peripherals. Neat custom racing setup in the left side. What is the best type of gaming chair? When deciding on your gaming chair, you need to consider what type of chair you want. We already outlined pretty much every type of chair. Of course, you probably won’t consider a console gaming chair if you’re a PC gamer, but you also need to think about if you want a more gaming styled chair, or just a good chair for gaming. 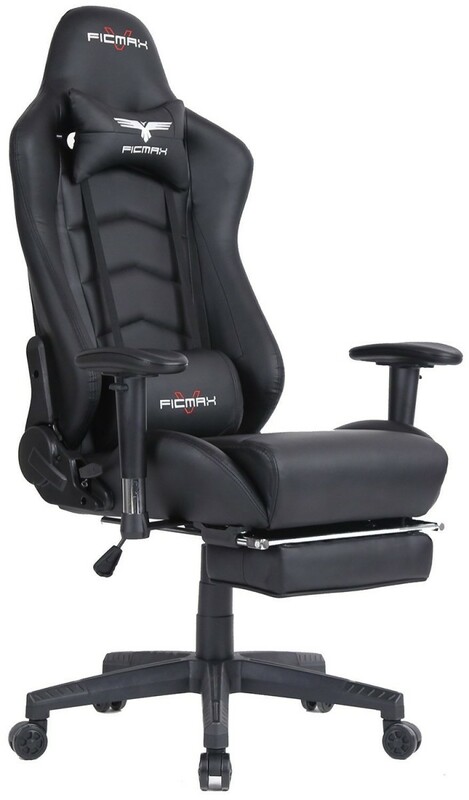 Gaming chairs do have limitations and due to their unique design and construction they aren’t as flexible as traditional ergonomic office chairs that are designed more on ergonomics and features than design, style, and a more luxurious type of comfort that gaming chairs offer. What is the best material for a gaming chair? Do you want mesh to keep yourself cool in the hot summer? Or do you want the comfort and premium feel of a leather-type material? This is something to think about and something people often forget. For me, I prefer fabric since it’s a good middle ground between the breathability of fabric, but it’s also more comfortable than mesh. What is the best gaming chair with the best armrests? When picking a gaming chair, usually you’ll have some pretty standard armrests. Some of the higher end gaming chairs have features that let you adjust them slightly, but don’t expect anything crazy. You may want to purchase some add-ons like these memory foam covers to make the armrests much better. What is the best gaming chair for a small space? One thing to know about gaming chairs is that they are usually pretty big. If you have a super small space like a dorm room or a small apartment room, a traditional gaming chair like a DXRacer might be a bit too big. However, this means you can just spend a little less on a cheaper chair in the $100 range or so to get a smaller experience. What are the Best Maxnomic Alternatives? What is the Best Dxracer Chair for a Short Person? Why Do People Still Play Old Games like Runescape? Great article man. That DX Racer chart is exactly what I needed.